Spider Sabich and Bob Beattie at the bottom of Aspen Highlands during a pro race, circa 1975. ASPEN — Friends and family of Bob Beattie remembered him Monday, April 2, as a groundbreaking ski coach and promoter of the ski industry who wasn’t bashful to call things as he saw them. Beattie, known as “Beats” to his friends, died at the home of his son Zeno Beattie in Fruita on Sunday, April 1, of various health ailments. Bob was 85 years old. He was an Aspen-area resident since 1970. “He really changed the status of U.S. skiing,” said Billy Kidd, who raced on the U.S. Men’s Ski Team coached by Beattie in the 1964 Olympics. Beattie became the head coach of the University of Colorado ski team in 1957 and at the age of 26 and won a title in 1959. He proved that college teams with American students could compete against colleges with a stacked lineup of overseas athletes. He went on to become the head coach of the U.S. Alpine Ski Team in 1961 and changed the way it trained and approached the sport. The team won four medals at the 1964 Olympics at Innsbruck, Austria, including the first medals ever won by U.S. men. Kidd earned silver in the slalom while Jimmie Heuga snared the bronze. Aspen native Bill Marolt said he met Beattie 60 years ago at the top of Snow Bowl on Aspen Mountain. Marolt was a sophomore at Aspen High School. Beattie was starting his coaching career at CU and urged Marolt to join the team. After a successful college-racing career, Marolt was on Beattie’s 1964 Olympic team. He said Beattie molded that group into a successful bunch through “sheer will” and his emphasis on teamwork. Beattie teamed with French journalist Serge Lang and French coach Honore Bonnet in 1966 to create the World Cup ski-racing circuit as a way to build consistent interest in the sport. 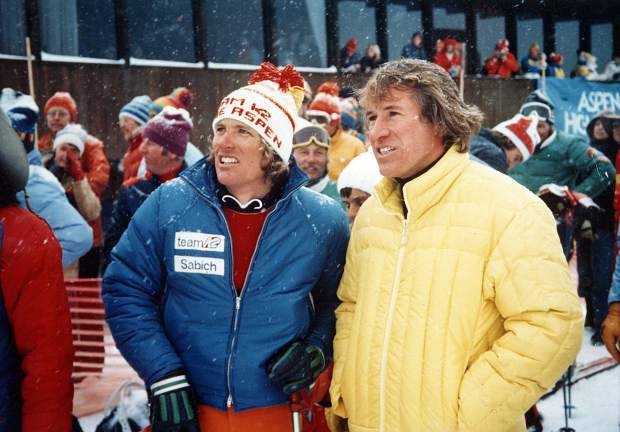 When the International Ski Federation, which governs the World Cup circuit, insisted on holding onto what Beattie felt was a “boring” format of skiers coming down the slopes one at a time, Beattie created the World Pro Racing Tour in 1970 to promote the dual-racing format he loved. He also took over coordination of the NASTAR racing program and guided it through extensive expansion. He was a longtime commentator on skiing and other sports for ABC and ESPN and was best known for his bubbling enthusiasm while calling classic races, including Franz Klammer’s dramatic victory in the downhill race in the 1976 Olympics. Kidd said it was remarkable that Beattie’s career spanned so many pursuits over such a long time. “He was one of a kind,” said Charles “Chuck” Ferries, who, as a member of the University of Denver ski team, competed against Beattie in the late 1950s and early 1960s. Ferries made the U.S. Olympic team in 1960 and again in 1964, when Beattie was coaching. It was a completely different experience with Beattie at the helm, Ferries said. The team in 1960 didn’t train together. Beattie insisted on the team spending as much time as possible on the slopes and in dry-land training together after 1961. Well, it wasn’t always fun, Kidd recalled. Ferries said there were two things that he took from his experiences as a member of the ski teams that Beattie coached. First, skiing is more a team than individual sport. It takes all team members pushing one another and trying their best to produce success. Second, the goal is always to be your best. He had his share of successes as a skier, including being the first and only American man to win the Hahnenkamm slalom at Kitzbuhel, Austria. Beattie deserves some of the credit, he said. Ferries remained close friends with Beattie after his ski career. “He had his own ideas and stuck to them and he stuck to them to the last days of his life,” Ferries said. Beattie moved to Aspen in 1970 after leaving the U.S. Ski Team and formed World Wide Ski Corp. Along its pursuits, the company oversaw the World Pro Ski Tour for 12 years and managed NASTAR. Zeno Beattie said his dad was a very determined man. Once he had made up his mind that something needed to be done, he would figure out a way to accomplish it. “The motto of our company is, ‘It can be done,’” Zeno said. Beattie had a lifelong passion for skiing but wasn’t able to get out on the slopes in recent years because of medical issues. Zeno said his dad was struck by a vehicle in France about 25 years ago and he suffered injuries that plagued him throughout the rest of his life. He retained a keen interest in ski racing throughout his life. Beattie was never afraid to ruffle feathers at the FIS or even the U.S. Ski Team. Beattie, who led the University of Colorado ski team to NCAA championships in 1959 and ’60, was inducted into the National Ski Hall of Fame in 1984, the Colorado Ski and Snowboard Hall of Fame in 1986 and into the Aspen Hall of Fame in 2004. Despite all his major accomplishments in ski racing, Zeno said his dad was especially proud of helping establish a recreational ski program through the Aspen Valley Ski and Snowboard Club that gets Roaring Fork Valley children out on the slopes at a low cost or free. More than 1,500 kids participate in the program. Zeno recalled that his dad wrangled with officials at Aspen Skiing Co. to get the program started. “Every day he would go in there and argue about the costs being too high,” Zeno said. A deal was sealed in 1986. Bob was pleased with the more recent dealings with the Crown family, owners of Aspen Skiing Co., and Skico President and CEO Mike Kaplan, Zeno said. Beattie, who was married four times, is survived by his wife of 25 years, Marci. In addition to Zeno, Beattie had a daughter, Susan, six grandchildren and eight great-grandchildren. “Most of us didn’t appreciate how important he was in our lives until years or even decades later,” said Kidd, now an icon of the ski industry in Steamboat Springs. The family is working on a public memorial service for Bob, likely in the fall.